The Mckee Foundation training in Guadalajara, Mexico is dedicated to all the little donors from everywhere in the world who desire to do a difference for humane animal welfare on this planet. -Dr. Yayo Vicente (Co-Founder and President of The McKee Foundation Strategy). -Dr. Blas Rivas (Surgery Program Director and Head Spay/Neuter Surgery Teaching Vet). -Dr. Olman Solano (Surgery Training Assistant to Dr. Rivas). -Dr. Eduardo Bitter (Volunteer Surgeon of The McKee Foundation). -Ing. Jennifer Rivera (Program Coordinator to The McKee Foundation). As of 2010, Guadalajara city is part of the Metropolitan Zone of Guadalajara (ZMG), of the Mexican state of Jalisco. The city has a population of 1 495 189 people and the ZMG has a total population of 4 434 878 people, making it the second most populous zone in Mexico and it is only surpassed by the Metropolitan Zone of the Mexico City (www.Jalisco.gob.mx, 2015). The Guadalajara Veterinarians from the Secretary of Health estimate that there is 1 dog for every 10 residents. However, based on his experience throughout Latin America, McKee’s President, Dr. Vicente, DVM, MPH, head veterinarian for the Costa Rican Ministry of Health, estimates that this number is significantly higher, as well as a published study by Ortega-Pacheco (2007) indicate that the ratio may be closer to 1 dog to every 4 residents in urban areas, and 1 dog for every 2 to 5 residents in rural areas. The Municipal Government of Guadalajara current method to decrease the street dog population is to trap, house for five days and euthanize, if the dog is not claimed. The kill rate is 95%. The Jalisco state and Guadalajara`s Municipal Government want to lower this percentage. Besides humane concerns, the fiscal impact of sheltering and euthanasia –which does not affect reproduction rates and therefore is futile as a method of population control- is a major factor in taking a look at another strategy. 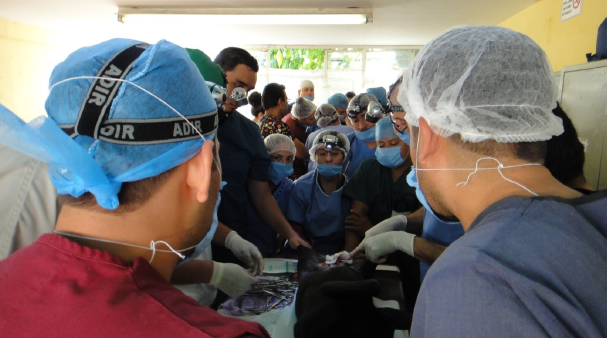 The Mckee Foundation was invited by the Government of Jalisco to visit Guadalajara city and teach the McKee’s surgery technique, our first visit was in October in 2013, where we trained 60 veterinarians and spay/neutered (s/n) 203 animals. Due to the success of the first visit the Mckee team was invited a second time in September of 2015. The Mckee Strategy not only provides a tool to humanely address overpopulation of companion animals, cost effectively, but also humanely addresses serious public health issues such as rabies. The campaign was organized by the Secretary of Health of Jalisco on behalf of the International Day Against Rabies. The training consisted of two days of lectures about the steps to create a s/n community campaign, urban myths about neutering, veterinary emergency pre- and post- operatory, advanced techniques of spay, importance of neuter campaigns to decrease the population of dogs and cats. Followed by three days of training, in the Anti-Rabies Center of Zapopan. 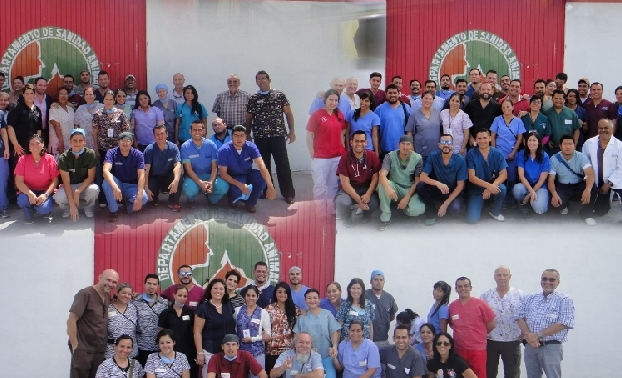 There were 60 training veterinarians in total, from the government sector, 19 veterinarians from the secretary of Health, 3 from the Cocula’s Anti-rabies center, 2 from Tonala’s Anti-rabies center and 18 from Zapopan`s Anti-rabies center. The private sector was represented by 18 veterinarians. On the other hand, the registration of the animals, the recovery of spayed animals, post-operative instructions to the owners and the agenda of the whole campaign was led by Ana Couret and her Adopting a Friend Foundation as well as other NGOs like Protección Animal, Odes, Calle 0 and Aproda. Each day of the training a veterinarian who excelled in the technique was chosen and given an award, the three top doctors were: MVZ Adán Gildo Cárdenas, MVZ Verónica Sotelo Villegas and MVZ Francisco Javier Mora Maldonado. Dr. Adán Gildo Cárdenas preparing for surgery. 60 key and influential Government and non-government veterinarians were trained in The Mckee Technique, small incision spay/neuter process*. 502 animals were neutered in total, 157 were felines (105 female and 52 male) and 345 canines (234 female and 111 male). Each veterinarian realized a minimum of 6 spays and neuters (3 cats and 3 dogs) individually. The DVDs with the specific instructions of the training technique were provided to all vets trained to ensure the review after the training in case of questions. * Micro-laparotomy for ovary-hysterectomy in female dogs and cats, a technique that is less invasive, takes less recovery time, has a lower risk of complications, cuts surgery time, uses less anesthesia, its cost effective and can be performed in rural settings. During the three days of practice spay/neuter the veterinarians faced some cases of emergencies due to the poor health of the animals or underlying medical condition and lack of experience in the new technique of the training vets. These emergencies were handled by the McKee training team, demonstrating how resolve such an emergency”. 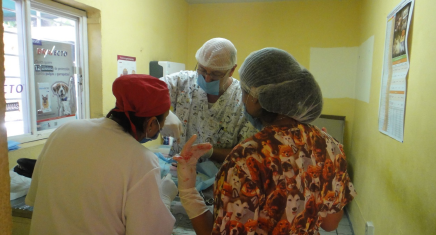 Spay/neuter generated a positive impact on the reduction of canine and feline population of the state of Jalisco, in the same way decreases the rate of canine euthanasia in the state. During 2015, there were fewer euthanized animals than in 2014 in the state of Jalisco and fewer in the city of Guadalajara, see table below. By teaching not only private practice veterinarians, but also Mexican government veterinarians that there is a humane alternative to lower animal population, cost-effectively, and addresses serious public health issues such as rabies and other zoonotic diseases, is a great step forward in animal welfare in Mexico. McKee could not have taken this step if not for the faith in and support of the small donors and the doctors of the McKee Project Foundation. Thank you from McKee for making a difference in the dark corners of animal welfare. 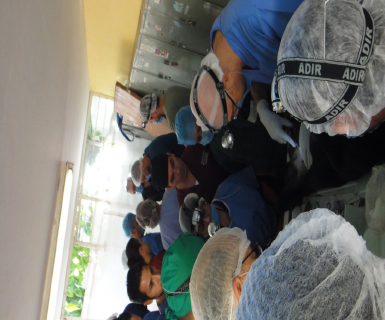 A special thanks to the Markoff Foundation for starting the McKee Markoff Surgery Instrument Program for veterinarians in Latin America to ensure enough sterilized instruments for high volume spay neuter surgery. Dr. Bitter teaching two veterinarians the McKee technique. Dr. Rivas and Dr. Solano teaching the Mckee Technique. What is the McKee Project? Learn About Our History!